Rebounding is a natural, instinctive type of low impact exercise. It was our very first form of exercise. Mother's womb was the waterbed where we learned to bounce. Parent's know how gently bouncing a crying baby can be calming. Children love to bounce on an adult knee or stomach. They begin bouncing on their own when their legs are strong enough. And you've probably seen kids bouncing on beds and other springy furniture. The benefit of exercise is absolutely necessary for good health. Protein molecules and toxins trapped in tissues must be drawn out through the lymphatic system for elimination. Exercise and deep breathing move the lymph fluid. Aerobic exercise is the vigorous type that oxygenates the blood and tissues, stimulates circulation and moves the most wastes along. Aerobic exercise includes walking, hiking, running, dancing, bicycling, and rebounding. Bouncing on a small trampoline provides the best exercise benefit! Rebounding will help you to slim down and clean the body. It moves the lymph fluid which carries trapped unmetabolized proteins and toxic wastes away from tissues so they may be eliminated. Using a rebounder is ideal for heart exercise. Rebounding is known to build muscles, so it strengthens the heart, increasing its capacity. Before long rebound exercise will lower your resting pulse rate and improve circulation. CAUTION: If you are not used to aerobic exercise, begin rebound exercise slowly for short periods and increase gradually, especially if it is likely you have a lot of toxins. Check with your doctor first if you have any health condition or are quite out of shape. Gently bouncing or running in place on a mini trampoline is low- impact, healthy exercise. It strengthens every cell in the body using the forces of gravity, inertia, acceleration and deceleration. Since rebounding will build muscles and improve all tissues, the eyes will be strengthened. Doing eye exercises while bouncing can improve vision. Bouncing on a small trampoline is the best exercise to increase bone density. This is a great exercise for those with osteoporosis, anyone needing better bone strength. Rebounding is excellent for pregnant women, seniors, overweight people, and those with a disability. Each person adapts to what they are able to do. Even someone in a wheel chair can put their legs on the rebounder or sit on it. A friend can bounce gently and both people will receive benefits. As you bounce, the body is moving in an electro-magnetic force field. The rebound unit has rubber feet, so the energy is not grounded. This energy can help the healing process of injuries and reduce pain. Thought power is magnified. Anything you concentrate on learning while rebounding is better retained. You can train yourself in changes of attitude and behavior by making affirmative statements while rebounding. Rebounding is completely beneficial. There is no jarring or straining. There is no shock to the body as in jogging or jumping rope. The springs of the unit absorb the impact. Rebound exercise is used by astronauts to strengthen bone density. A rebounder is often used by champion athletes to build muscles. Rebounding can reduce your body fat; firm your legs, thighs, abdomen, arms, and hips; increase your agility; improve your sense of balance; strengthen your muscles over all; provide an aerobic effect for your heart; rejuvenate your body when it's tired, and generally help you to a state of health and fitness. You can easily perform this exercise in your living room, your office or your yard. 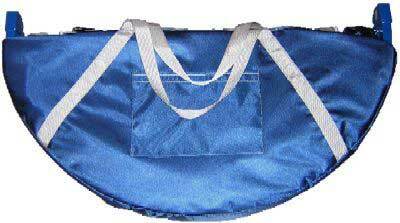 The traveler may wish to carry a folding rebounder for use in a hotel room. It's the most metabolically effective form of exercise around. Rebounding is fun, convenient, low impact, ideal exercise. Bouncing is something everyone in the household can enjoy daily. IT FEELS GOOD! You can rebound without getting bored. You can listen to music or educational tapes; or you can watch TV while bouncing. Rebound exercise does not exhaust you. In fact it energizes you. Although 20 to 30 minutes is ideal, even a few minutes at a time will be of benefit. Every home should have a mini trampoline so that the best form of exercise is available anytime. 10 inches high ~ weighs approximately 25 lb. user weight capacity up to 300 lbs. old style spring - 3.5 in. Needak barrel-shaped spring - 4.25 in. Needak uses a mat made from Permatron material, which has a smooth finish- It should give no stretch during the downward landing, while at the same time providing a resilient rebound. The Permatron is resistant to ultraviolet rays, doesn't break down as do other fabrics, and allows no moisture absorption. The mat is sewn together using 5760 stitches of high-grade nylon thread with two layers of strong polypropylene webbing stitched around the mat's edges. Attached to the heavy-grade, all steel round frame is an oversize spring mechanism holding four-inch-long, custom-made jumbo springs which deliver a soft bounce. Thirty-six springs made of quality wire will hold the mat to the frame. The springs are shielded by a protective cover. Individual spring mounting pins prevent frame wear. 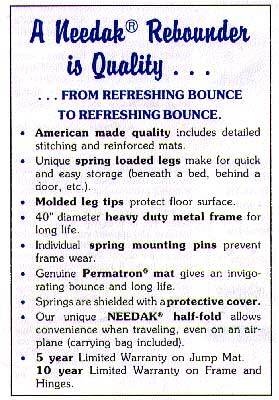 The Needak Soft-Bounce Spring absorbs as much as 85% of the impact of each bounce. This is due to the unique barrel shape of the spring. The diameter of the coils increases as you move toward the center of the spring. Note: when you flex metal, it will eventually break. So, if you use your Rebounder often, eventually you will have to replace the springs. Replacement springs are available. Contact Us for ordering multiple rebounder items with one shipping charge. NOTE: The shipping is included for U.S. orders only. Contact us for info on shipping to other nations.